When defending the spread option, the first thing we think about is what form of structure we want for our defense. 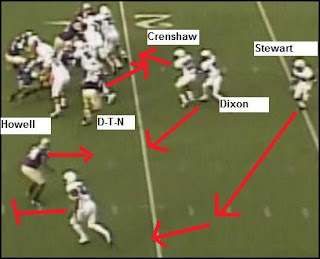 As all football progresses in cycles, what we are really defending is the triple option without a seal block. The offense is trying to seal our LB by the action of the RB. We choose to defend the spread attack using a 3-4 (5-2) defensive structure. We like this defense because it adds an extra athlete to match the athleticism of the offense.